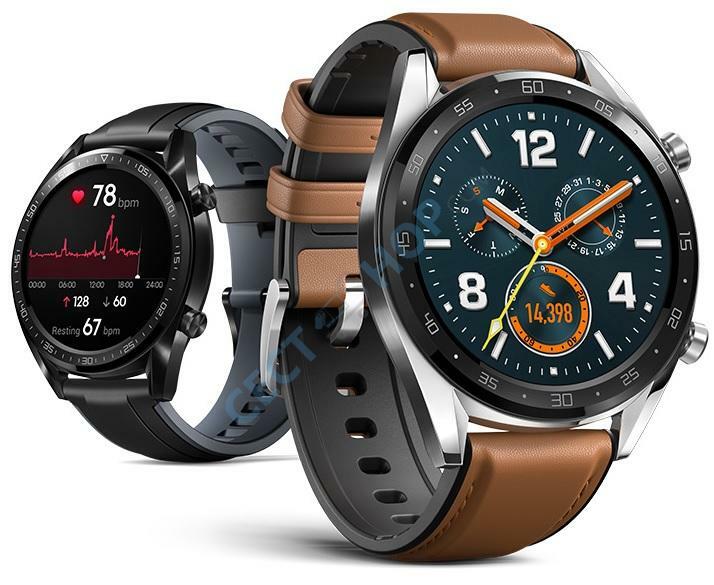 The Huawei Watch GT is a waterproof smart sport watch. It comes with a 1.39-inch AMOLED Display with a resolution of 454*454 (326PPI). The Watch GT incorporates GPS, GLONASS, and Galileo support for the best possible location tracking, which should please long distance runners. The watch case is made of stainless steel and is only 10.6mm thick, so it feels like a traditional watch on the wrist. The straps of the Steel color edition are a leather and silicone combination to resist sweat and prolong the lifespan of the leather. It is comfortable and looks good, plus there are quick-release pins to make changing the strap simple. Huawei has added artificial intelligence to make life a little easier. It understands where it is on your wrist when taking your heart rate, which will result in better and more accurate results, plus it knows when you’re active and when you’re not, at which time it will switch the chip — designed by HiSilicon for the Watch GT — into low power mode to conserve energy. The Watch GT interacts with Huawei’s Health app, which is available for iOS and Android, and employs the excellent TruSleep 3.0 system for measuring sleep patterns. The charging plate of the Huawei Watch GT uses magnets and two pins to clamp on the back of the watch to securely charge it. It's 5ATM waterproof so you can take it with you to the pool for swimming exercise. Battery life is where the Huawei Watch GT truly shines it last up to almost a whole month without needing a charge if you’re using the watch without its always-on display active or GPS. The fashionable smartwatch packs a battery with 420mAh capacity. Buy the Huawei Sport Smart Watch GT now online at CECT-Shop.com!